I feel like I start every blog post lately whining about how I haven't been blogging much. 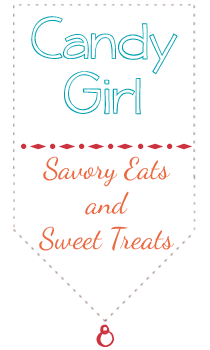 But here I am again, this time participating in French Fridays with Dorie where it has been forever since I've completed a recipe. The Ispahan Loaf Cake is something I have been wanting to make since the book came out. My desire to make this was on the name only. It sounds so exotic. When I read the recipe and saw that it called for not one, but two, difficult to find and expensive ingredients, I had second thoughts but was determined to make the cake. Rose syrup and rose extract are both used here. I looked at several stores here locally, including a couple of middle eastern grocers (hard to believe that Lexington, Kentucky has two middle eastern grocery stores but it's true) and couldn't find the rose syrup. I ended up buying a rose raspberry syrup at Williams-Sonoma that worked fine and just left the rose extract out. This cake is full of texture from the almond meal. Raspberries dot the interior providing a lovely splash of color and more texture. It was very good and not overly sweet. A hint of floral flavor is in the background and I'm sure this flavor was more prominent for those that used the real deal rose syrup and the extract. I'm glad I joined along this week as I have missed this group. 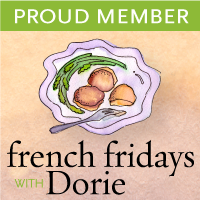 Please visit French Fridays with Dorie to see what the rest of the group did this week! Beautiful! I'm glad someone else used almond meal which I love, rather than the more white almond flour which lends this cake a palate that can be pink instead of brown. I too love the textures in this cake. Your sub choice is smart. p.s. Love the 'cake' fork! Mmmm...rose raspberry syrup sounds enticing. It's begging to be turned into a cocktail. (more so than the regular rose syrup.) Looks good! Your loaf cake looks lovely - nice rows of wonderful, fresh raspberries and I agree with Jessica, the "cake" fork is just fabulous! 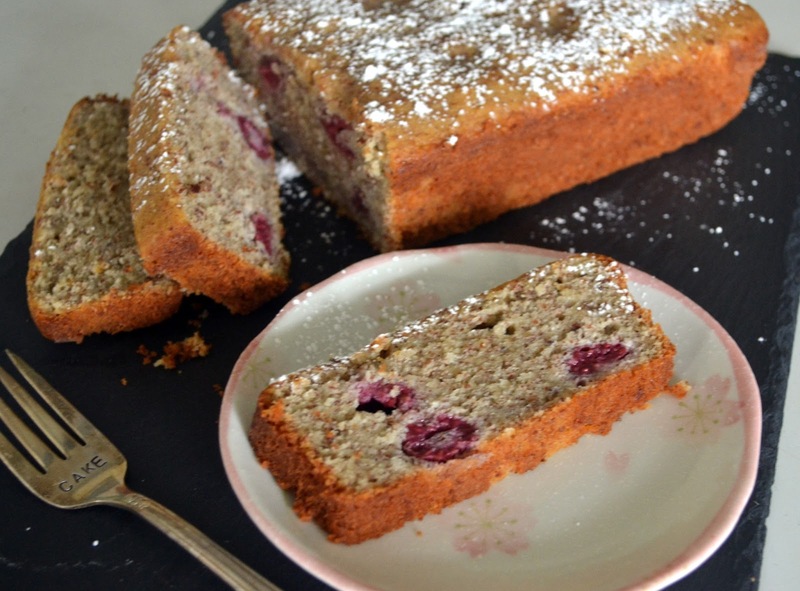 The syrup that you used for your cake sounds wonderful - I have never seen rose raspberry syrup before but I am sure it lends a lovely flavor to this cake. I didn´t find rose syrup and made it myself, but I think a rose raspberry syrup is probably much better. Glad it turned out great, and that you´re baking along! Lovely looking cake! It's such an alluring combination of flavors - I can understand why you couldn't resist making it! Nice to "see" you this week, Candy! Your cake looks great. I used rose syrup and extract and found the flavor a bit too overwhelming, so I think your subtler syrup was a good choice. Candy, I totally feel you on trying to avoid mentioning how long it has been since my last post. Life happens, work happens... sometimes blogging is the thing that gets sacrificed. Your cake looks fantastic - and I want that fork!